When a classic cartoon character declared that everybody’s favorite animated bunny was a buck-toothed varmint, his dental assessment was astute. The lagomorph known as Bugs had lengthy incisors. In reality, rabbits' incisors grow throughout their lives. 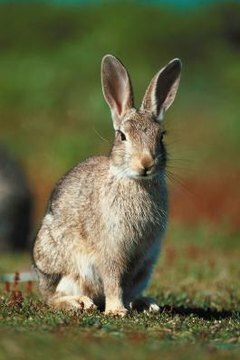 Rabbits and members of the rodent family share this trait, which plays a role in their survival. A baby rabbit has 16 deciduous teeth, replaced by 28 adult teeth. These teeth include the incisors, which are the visible front teeth, and cheek teeth that consist of molars and premolars. Rabbits do not have the fanglike canine teeth that dogs and cats possess. All of a rabbit's teeth have open roots, enabling them to constantly grow throughout the rabbit’s life. These teeth can grow 3 to 5 inches annually. Rabbits and rodents are the only animals with open-root tooth structure. Rabbits are herbivores, meaning that their diets consist solely of plant material. The fibrous nature of their diet is crucial for maintaining a rabbit’s optimal gastrointestinal health. In the wild, a rabbit’s buffet menu often includes hard vegetation such as hay, tree bark, twigs and other material that requires lots of chewing. The extensive chewing and gnawing that rabbits regularly engage in balances the perpetual tooth growth. If a rabbit’s teeth were not open-rooted, they would wear down very quickly, eventually rendering chewing such dietary requirements extremely difficult. In the wild, rabbits have unlimited access to the vegetation that keeps their growing teeth under control. Pet rabbits are much more limited and require continuous supply of timothy hay. Commercial rabbit pellets are not formulated for the same chewing action that fibrous plant material requires. Veterinarians recommend that pet owners provide their rabbits with minimal daily amounts of these pellets and supplement with all the timothy hay the rabbits can eat, along wither some high-fiber vegetables. Providing woody materials or chew toys to gnaw on is also encouraged. Rabbits who do not wear down their teeth evenly are likely to develop malocclusion, which leads to painful dental problems that include abscesses, wounds inside the oral cavity and difficulty eating. Take your rabbits annually to a veterinarian for complete health examinations including assessment of the rabbits' teeth. Educate yourself about the symptoms of dental problems so you can seek prompt treatment and relief when necessary.